Whenever I ask my husband if he's got any special requests for the next week's dinner lineup, he always responds (in a petulant child's voice he puts on for my amusement), "Tacos!!!" Really, I don't know why I even bother asking, as this is almost always his response. By now, it's a running joke in our house. One of the reasons Tacos are so universally loved is probably their amazing versatility. They really do offer something for everyone. We've surely explored the wonders of Tacos before on NK. As a refresher, check out our quickie version of Tacos al Pastor (my all time favorite Taco preparation, recipe HERE), and of course, my friend Marina's extremely delicious version Baja Fish Tacos - recipe HERE. So I ask you, who doesn't love a good taco? This week's Taco inspiration comes from a recipe I adapted from Cooking Light. These spicy Mexican-style Chicken Tacos have a ton a flavor and not a lot of fat. Ancho Chile Powder provides a real kick, and cooling Avocado Crema adds richness. Best of all, these are incredibly easy to prepare. Since nothing complements a Taco better than Beer, we'll also share our favorite recipe for an amazing, spicy Mexican Beer-based cocktail, the Michelada. Prepare the Spice Rub by mixing all ingredients together. 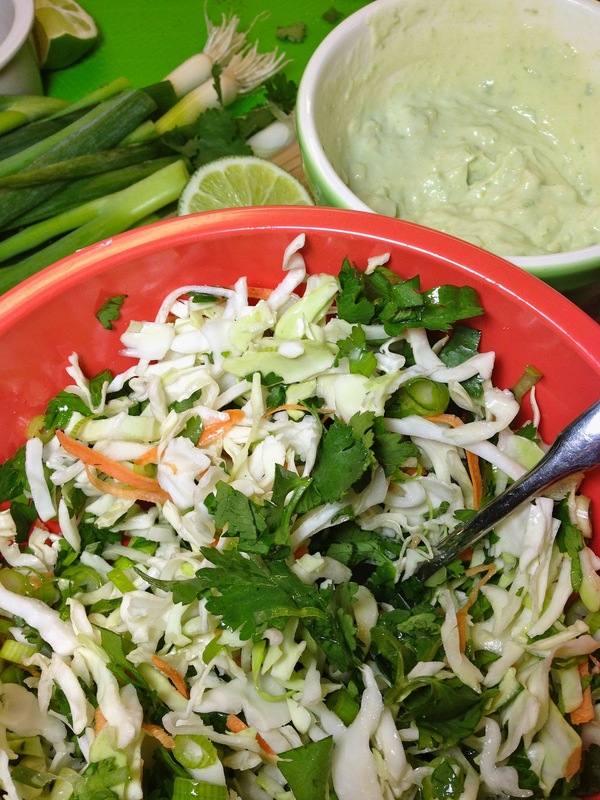 In a medium bowl, prepare the Slaw by mixing all ingredients together. Toss well and set aside. Prepare the Avocado Crema by mixing the Sour Cream, 2 Tablespoons of Lime Juice, 1/4 teaspoon Lime Zest, Salt and Skim Milk in a bowl. Next, add the Avocado chunks. Using a fork, stir vigorously mashing avocado as best you can into the bowl to break it down. When you have made the mixture as smooth as possible, it should be a pale green shade. Add 1 Tablespoon Canola oil. Toss Chicken pieces together with the Spice Rub until evenly coated. Add seasoned Chicken to skillet. Cook about 4 minutes, stirring frequently, until cooked through. Remove chicken to a plate, cover lightly,and set aside. To Assemble: Portion some Chicken in the middle of the Tortilla, drizzle with about 1 Tablespoons Avocado Crema, and top with a 1/4 Cup of the Slaw. Optionally garnish with a think slice of Avocado. Add your favorite hot sauce and enjoy! If you've got extra Slaw and Avocado Crema, just mix them together and save overnight in the fridge. The next day, chop up half an Orange or other Citrus and mix into the Slaw, squeezing a bit of the juice on top. Pick up an an extra Avocado, cut in half, and season with Salt and Pepper. 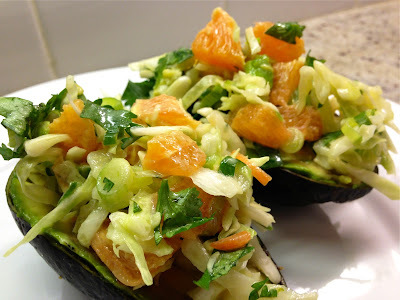 Stuff with Avocado Crema and Orange Slaw. Makes a great side dish! Put Kosher Salt on a plate and sprinkle the Ancho Chile Powder over it. 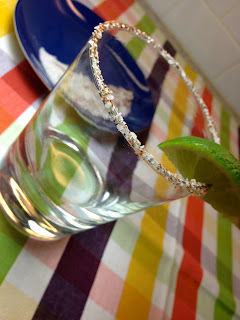 Rub a fresh Lime quarter around the rims of each glass and place it rim down into the Salt and Chile Mixture until evenly coated. 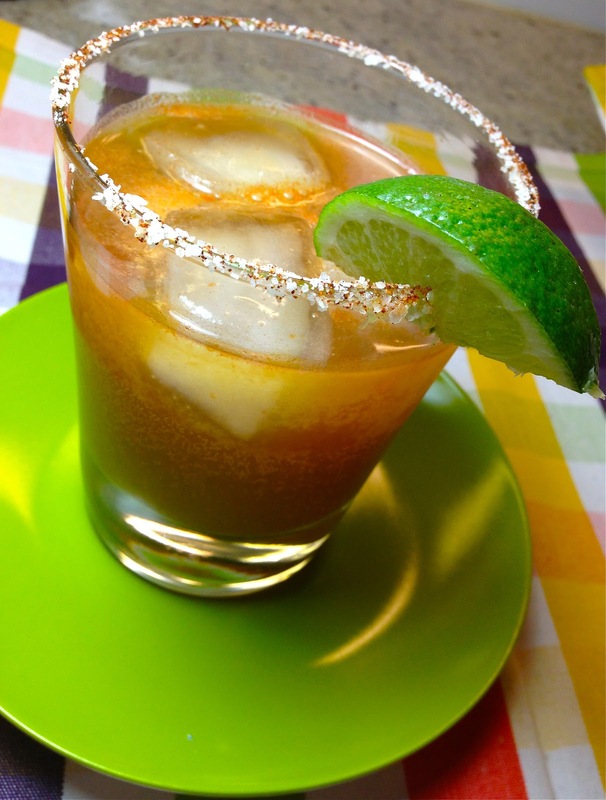 In a separate pitcher or large glass, mix Beer, Lime Juice, 2 teaspoons of Hot Sauce (or less if you prefer), Soy Sauce, and Worcestershire. Mix well. Place 3 ice cubes in each glass and pour Beer Mixture over. Garnish with a Lime Wedge. Cheers! The clocks have moved forward, the days are longer, and the first day of Spring is upon us. Not a moment too soon. Overcome with warm weather anticipation, I set out yesterday to create a beautiful spring-ready appetizer that celebrates the bounty of seasonal produce that lies ahead. Our Goodbye Winter, Hello Spring dish uses a versatile veggie that bridges the gap. 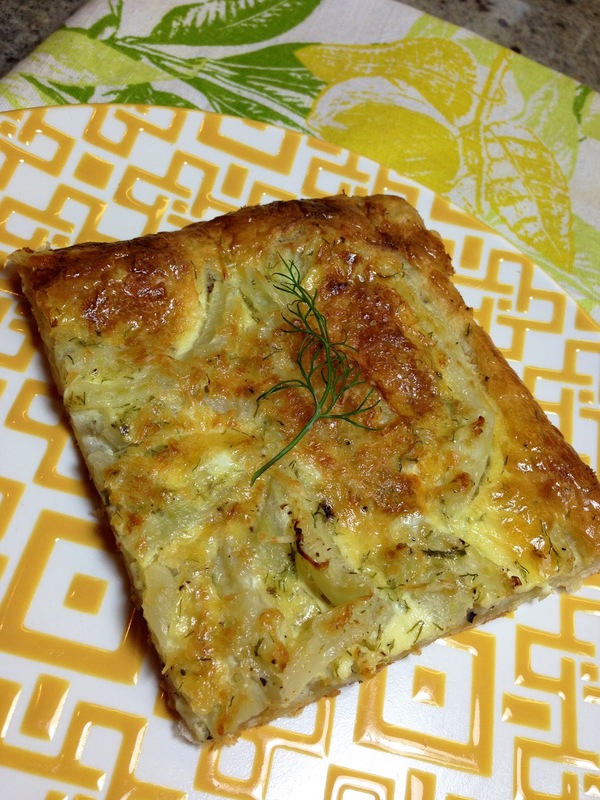 It also happens to be a personal favorite of mine - Fennel. 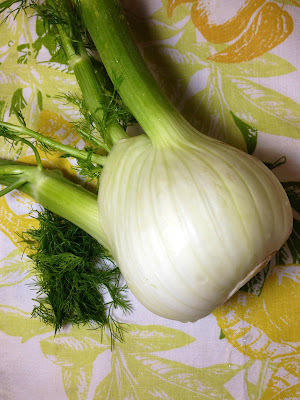 Fennel is an amazing vegetable that hits its peak in mid Winter but is available from Fall all the way to early Spring. Another fun fact- Fennel is edible from top to bottom. The fronds, or delicate leafy greens atop the stalks, are lovely and herbaceous. They also make a beautiful garnish. 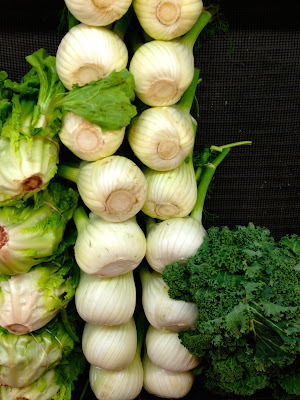 Fennel's large white Bulbs, with the exception of their hard inner core, offer a mild licorice flavor and pleasant crunch when consumed raw. Once cooked, the Bulbs sweeten considerably and offer a subtle flavor that works with a wide variety of pairings. Cooked Fennel tastes, at least to me, like spring feels - warm, sweet, mellow. Ahhhhhh. 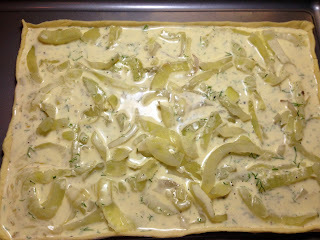 I hope you like today's incredibly easy yet impressive Savory Fennel Creme Tart as much as we did. It's perfect warm or at room temperature and makes for a great make-ahead party offering or holiday appetizer. It may even pop up at our Easter celebration. 1 Large Fennel with Stalk attached - Fronds (leafy tops) pinched off and minced (1 Tablespoon worth) and Bulb cut away (any bruised skin shaved off and discarded). Save some additional Fronds for garnish. 1 Sheet Frozen Puff Pastry, fully defrosted. 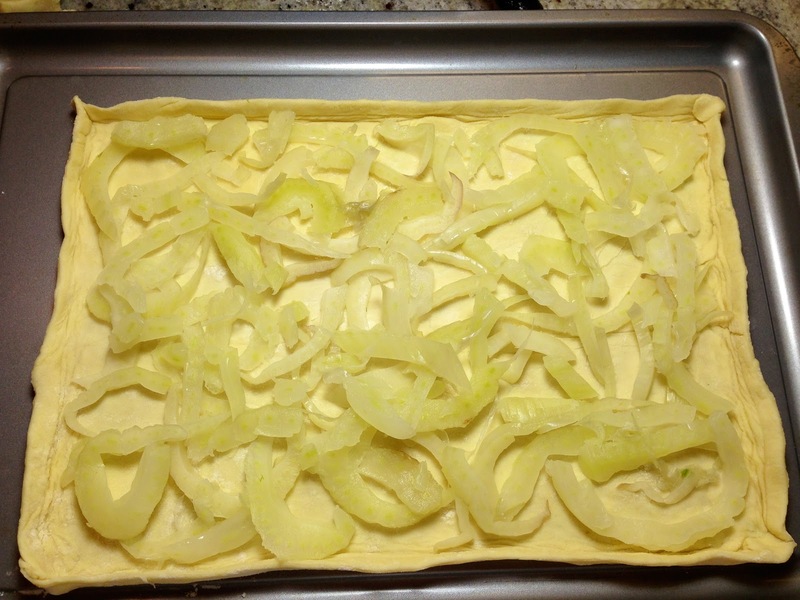 (Puff Pastry usually comes two sheets to a package so if you like, you can easily double this recipe) *Be sure to cover with saran while defrosting to prevent drying. Defrost Puff Pastry for about 30 to 40 minutes. Preheat the oven to 390. Boil a large pot of salted water. 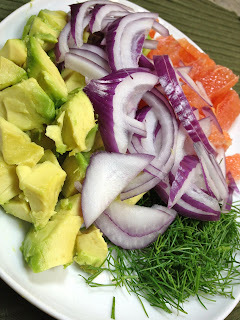 Cut off the Fennel Stalk and set aside. Add the Fennel Bulb to the boiling water and continue to cook for 15 minutes. When Fennel is done, remove it and rinse with cold water. Dry the outside thoroughly and slice horizontally as thinly as possible. The slices will look roughly like rings. Discard the circles of hard inner core that you find. Take the remaining slices of fennel and pat dry with paper towel. Set aside. Lightly grease a baking sheet with sides with butter or a tiny bit of Oil. Prepare Creme Filling by mixing the first six ingredients. 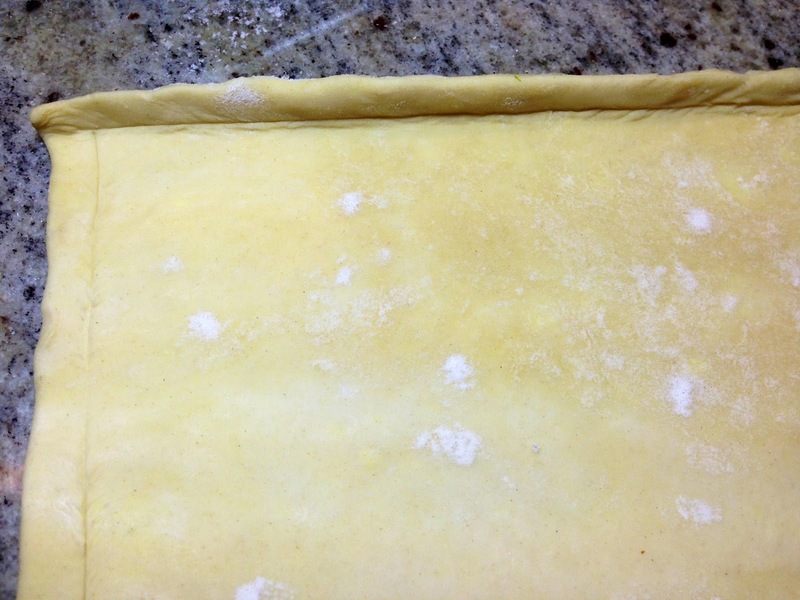 To Prepare the Puff Pastry Dough, Flour a surface lightly and lay the Dough down. Sprinkle the top of the Dough with some more flour. Cut the top third of the Dough off to form a rectangular shape (though you can also create any shape you choose). Roll the Dough Lightly with a rolling pin until it is about 1/8 inch thick. Move the Dough to the baking sheet and trim the edges of the Dough with a knife to make the rectangle more even. Next, score the Dough all around the rectangle about a centimeter in from the edge. 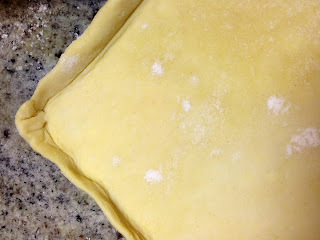 Fold the scored edges in at a 90 degree angle to form a crust. 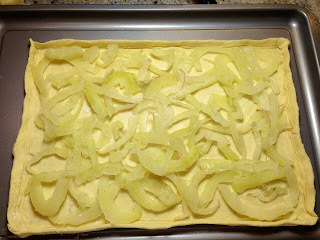 Pinch the corners really well so they stay fused, also pressing the insides of the corners into the base of the tart. 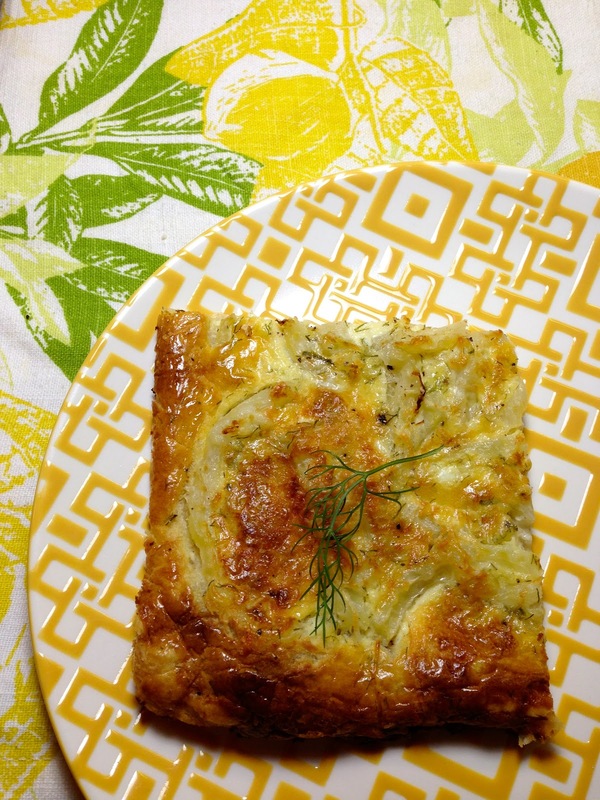 Arrange Fennel all over the Tart (as pictured). Next, carefully pour in as much of the Creme as it takes to the cover the Tart (don't overfill). There will likely be some Creme leftover. 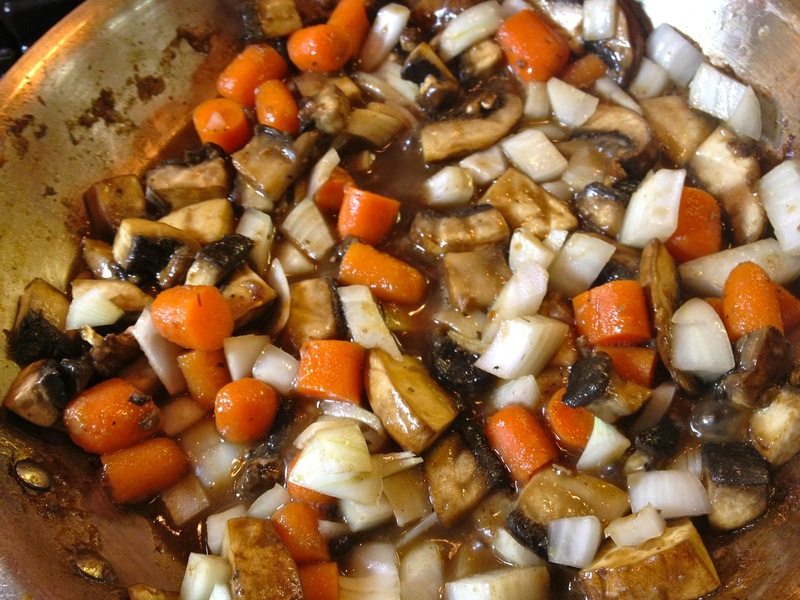 Finish with an additional dash of Black Pepper. Bake 40 minutes until crust is crispy and golden. Cool a bit, clean up the Tart edges with a knife if any of the Creme spilled over (*see cook's note below), and garnish with additional Fennel Fronds. Slice, serve, and enjoy! You may use this same filling with puff pastry fitted in a tart pan or even in a prepared pie crust (though cooking time may change). 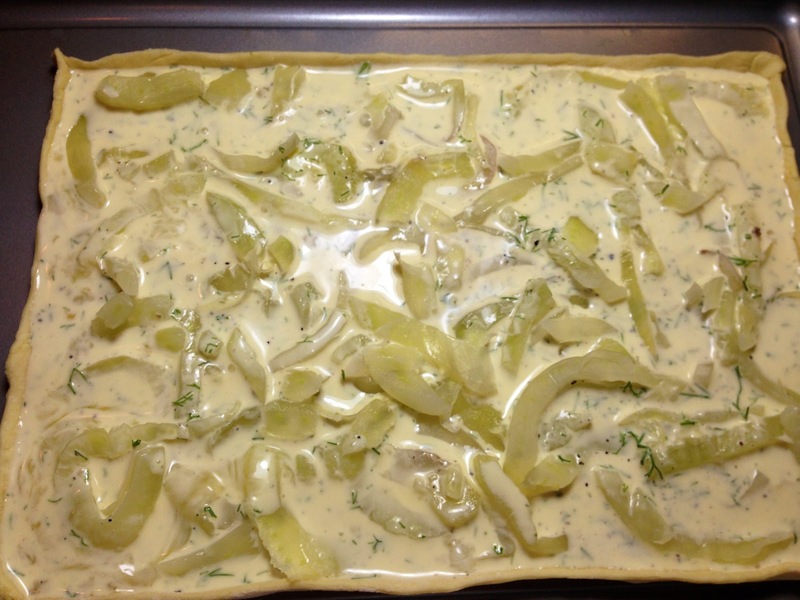 Because I like to keep this tart nice and thin and prefer to prepare it without the use of a tart pan, there is a chance that some of the filling will flow over the sides of the crust as the tart bakes. This is absolutely ok! If any overflow occurs, simply allow the tart to cool a bit and trace around it with a knife to clean up the edges. It will come out looking just perfect so don't fret! Today's hearty lunch recipe is an excellent example of how just one very special ingredient can really amp up a dish. In this case, a modest portion of fresh Maytag Blue Cheese takes the ubiquitous Buffalo Chicken Sandwich to new heights. Our easy Pulled Chicken Sandwich offers all the tangy Buffalo Sauce flavor you crave, and makes for a great casual lunch or even dinner option. Homemade Buffalo Sauce allows you to adjust the flavor to your taste. I prefer to use Boneless Chicken Thighs for this recipe because they are moister than breast meat, but if you are more into white meat, you can use boneless breasts that have been sliced in half. Boil a large pot of water over medium high heat with the Onion (if using). Lightly Scoop out the middle of the buns if using Brioche. Combine the sliced Celery, Olive Oil, and a pinch of Pepper in a small bowl. Set aside. Once pot comes to a boil, add the Chicken Thighs. Cook for 5 minutes and then turn the flame down to medium heat and continue to cook another 15 minutes. Check for doneness. Juices should run clear and the Chicken should be fully opaque. Remove the Chicken to a surface for shredding. While the Chicken is cooking, prepare the Buffalo Sauce by combining all the ingredients in a small bowl. Feel free to adjust flavor by adding more Hot Sauce or additional spices. Once Chicken is cooked, shred it as best you can using two forks, pulling it apart into strings. Pour the Buffalo Sauce over the Shredded Chicken. Place Buns in a broiler pan and stuff with ample amounts of Chicken. 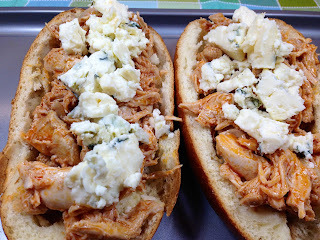 Top each sandwich with some crumbles of the Maytag Blue Cheese and broil for 2 minutes. Top with the Chopped Celery and serve hot. Citrus Fruits really hit their peak in the winter season, and Grapefruit is no exception. So when I got my hands on a really gorgeous Red Grapefruit, I knew it deserved a very special preparation. I've made many a salad using citrus and fennel before (like this Blood Orange and Fennel Salad), but never a Panzanella. If you aren't familiar, Panzanella is a Tuscan Salad preparation and yet another fantastic way to use leftover bread (a method in the same spirit as our last Tuscan dish, Pappa al Pomodoro). Panzanella is typically a Summer Salad made with chunks of often stale Bread incorporated throughout (more info on its history HERE). When the salad dressing soaks through these little croutons of goodness, extraordinary things happen. As you might imagine, many such humble dishes arose as a way to make peasant food as delicious as possible. When I happened on a wonderful wintery riff on Panzanella from a blog called the The Vintage Mixer, I knew it was just the thing. With a few very minor tweaks to tailor this lovely recipe to my taste, the result was quite extraordinary.The key to this dish is using extremely ripe Red Grapefruit. If you are looking for a wonderful Summer Panzanella, my go to recipe is from Ina Garten. Check it out HERE. Prepare the Bread Cubes by placing them in a ziploc bag or bowl, drizzling with Olive Oil, sprinkling with the Spanish Paprika, Salt and Pepper. Shake or mix until evenly coated. Lightly toast the Breadcrumbs on a cookie sheet in toaster or oven until golden. Set aside. Next, combine all the dressing ingredients, and set aside. To prepare, Toss Grapefruit, Onion, Fennel and Bread Cubes together and sprinkle with a good amount of the dressing (you may have leftover). Sprinkle some of the remaining dressing over the Avocado. Plate the salad, dot with the Avocado, garnish with some Fennel Fronds and serve! Our Italian food mood continues with today's Meatless Monday recipe - a stellar yet simple pasta dish adapted from one of my favorite restaurants, Frankies Spuntino (check them out HERE). With two NYC locations, proprietors Frank Castronovo and Frank Falcinelli have, for nearly a decade, turned out tasty Italian small plates by focusing on fresh, local ingredients and un-fussy preparations. My Mom and I discovered their Carroll Gardens Brooklyn location, Frankies 457, soon after it opened and well before it became so darn popular. To think ... we used to be able to waltz right in. What's great about today's plate? 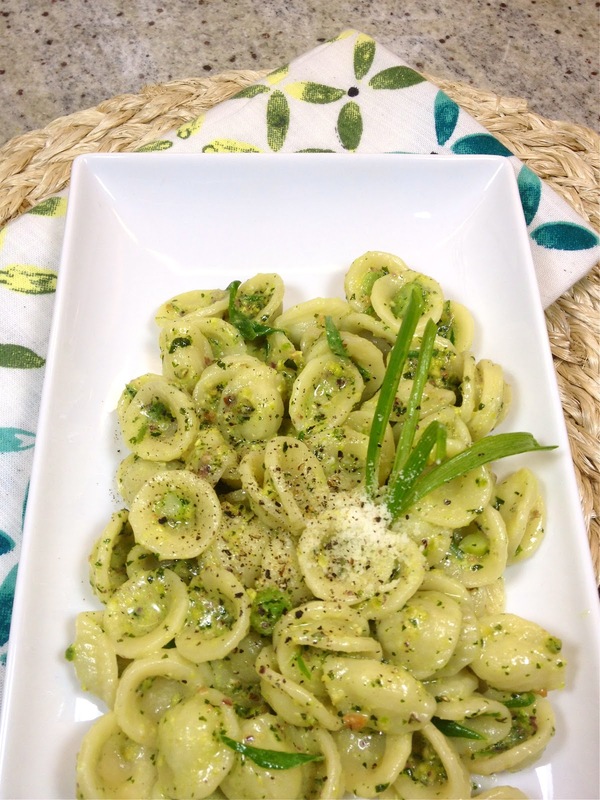 Orecchiette with Pistachio Basil Pesto and Scallions is brightly flavored, easy, and casually elegant. It's as perfect as an appetizer as it is as a main course and even tastes great at room temperature if you'd prefer it to be more like a pasta salad. Even better, this dish is a good way to use leftover Basil (which we happened to have plenty of from our last dish of Pappa al Pomodoro HERE). Frankies' original recipe uses an equal amount of Mint rather than Basil. Feel free to try both ways of making it depending on which herbs you have on hand! 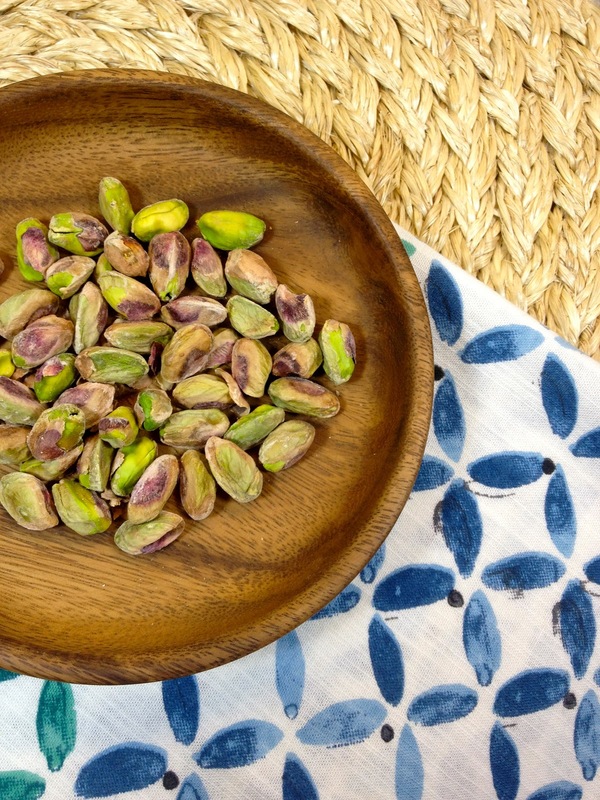 In a small food processor, process the Pistachios until coarsely chopped. Next, add the Olive Oil, Basil Leaves, and Garlic. Pulse about 10 times to combine. Transfer Pesto to a bowl and stir in the Parmigiano Cheese. Fold in the julienned Scallions and set aside. Once water comes to a boil, cook the Orecchiette according to instructions (usually 10 minutes for al dente). When Pasta is cooked, drain into a colander over a bowl, and reserve a 1/4 cup of the Pasta Water. Return drained Pasta to the pot over a low flame. Stir in the Pesto/Scallion Mixture and the Pasta Water. Continue to cook over low heat for a minute or two, tossing, until Pesto has coated the Pasta fully and the liquids thicken. Taste for seasoning and add a pinch of Salt - this will really make the flavors pop. Plate, and optionally sprinkle with a bit of Parmigiano Cheese and some Black Pepper. Pappa al Pomodoro is a thick Tuscan soup that incorporates cubes of day-old crusty Bread with fresh Tomatoes resulting in an incredibly hearty and satisfying meal. The first time I tried this dish was back in 1999 while traveling with my mom Italy. We dined at a restaurant in Florence called Il Latini. With its traditional Tuscan menu including Bistecca (giant chops of grilled T-Bone Steak), delicious, towering plates of paper-thin Prosciutto, and bottles of Chianti on each table that they'd sell to you by the inch, Il Latini made an impression on me. Among the many dishes we tried, Pappa al Pomodoro stood out because of its bright and delicious tomato flavor and overall simplicity. Now if you were to ask my mom about my impressions of our amazing Northern Italian adventure, she'd tell you I spent most of my time whining about missing my then-boyfriend and being a general pill. Looking back, I can't rightly disagree. But what my mom didn't realize was that even to this crabby teenager, our trip to Italy was a pivotal moment. The sheer magic of the country was, from then on, etched on my soul. The next leg of our trip brought us to Venice where I remember being even more awestruck. It seemed to me like a postcard come alive. Pappa al Pomodoro is as easy as it is delicious. Traditionally prepared with ripe, fresh Tomatoes, it comes together fairly quickly. In winter, when truly ripe Tomatoes are very hard to come by, I like to use Whole Peeled San Marzano Tomatoes in the can. This is a little trick I apply to many Fresh Tomato recipes. I think I was in the mood for this Soup because my family has been discussing a possible Italy trip. Very exciting - I'll keep you posted! For today's dinner, I adapted both the Mario Batali version of this recipe and that of his former sous chef, Anne Burrell, taking my favorite aspects from each. 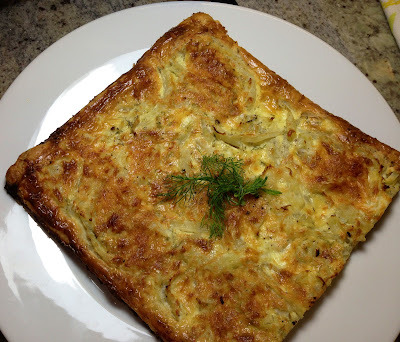 The result was delicious, comforting, and very filling! Enjoy and Buon Appetito! Prepare and chop Bread if you have not already. Set aside. Set a colander over a large bowl and pour in the contents of the Can of Whole Peeled Tomatoes, taking care to reserve most of the juice. Remove the bowl and set aside. 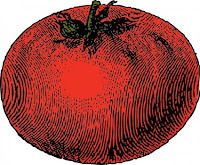 Rinse Tomatoes under cold water and remove to a large cutting surface. The Tomatoes will release a lot of liquid once cut so take care to place them on a large surface. Roughly chop the Tomatoes and return them to the colander. Rinse again under cold water, shaking, until most of the seeds have been washed away. Allow to drain in the sink until ready to use. Coat a large, deep skillet with the Olive Oil and heat over medium heat until hot but not smoking. Add the Onion and Garlic and saute, stirring frequently, for about 4 minutes until Onion begins to become translucent. Add Chopped Tomatoes and their Reserved Juice. Bring to a boil. Next add 1 Cup of Tomato Juice and 1 Cup of Water. 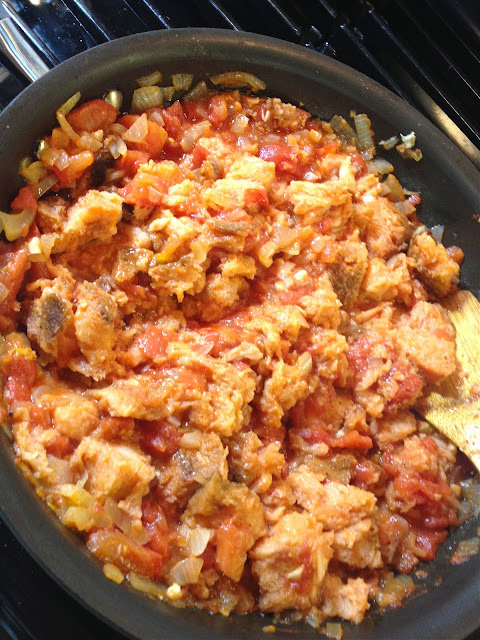 Lower the heat to a simmer and let Tomato mixture cook for 5 to 7 minutes until the Tomatoes begin to break down. Next, add the Bread Chunks and the remaining Cup of Tomato Juice. Stir. Continue simmering a few minutes longer until the Bread has soaked up as much liquid as possible. Stir in the Basil Chiffonade and sprinkle on a healthy dose of Black Pepper and an optional pinch of Crushed Red Pepper. Let soup simmer an additional 10 minutes, stirring occasionally. Taste for seasoning and add a pinch of Kosher Salt if desired. To serve, transfer the Soup into warmed soup bowls. Garnish each with a Basil Leaf and a sprinkle of Parmigiano Reggiano.